The most feature-packed and functional RGB controller in the market. 12 plug & play ports make HTW1012 fully compatible with Media Highlighter lightbars. Internal terminal blocks make it possible to hardwire ribbon lights and tape lights with ease. Power supply sold separately. 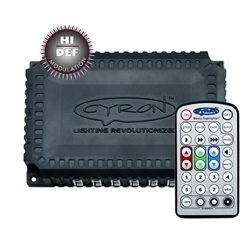 Consult with your dealer or CYRON tech support about other accessories available for your lighting project. Good controller, exactly what I expected it to be. At first I was a bit skeptical when buying this product, mainly due to its price. But, after receiving my product in only one week and with free shipping, I started to have high hopes about the product. And boy was this purchase worth it! The RGB smart controllers range is fairly high, lighting up my lights across my living room with ease.